Brain imaging studies of hypnosis are particularly valuable as they can sidestep the 'demand characteristics' problem common to much hypnosis research. In the past researchers have had to rely on subjective report to confirm the effectiveness of a suggestion, but with neuroimaging technology we can look to see directly how a suggestion affects brain function. Like other hypnosis research, neuroimaging studies can be divided according to whether they are 'instrumental' and 'intrinsic'(Reyher, 1962; Barnier, 2003;Oakley, 2006). Instrumental studies use hypnosis or suggestion as a research tool to investigate specific phenomenon, whereas intrinsic studies focus more on what is special about hypnosis. (The distinction in the following table between intrinsic and instrumental studies sometimes isn't clear cut, but it's a useful heuristic). It is hard to overstate how useful brain-imaging studies have been in demonstrating the effects of hypnosis to a wider audience. They have been particularly useful in demonstrating that hypnotic subjects genuinely feel the effects of suggestions as 'real' - they are not (always) faking or trying to please the experimenter. Jiang, White, Greicius, Waelde & Spiegel (2016) A very large fMRI study comparing high- and low-hypnotizable participants in hypnosis and no-hypnosis conditions. Activity in the dACC was found lower in high-hypnotisables, and was found to negatively correlate with perceived depth of hypnosis. Changes in brain connectivity were also observed during hypnosis: there was an increase in connectivity between the DLPFC and insula, and there was a decrease in connectivity between the DLPFC (executive control) and the resting state network. The authors argue "In sum, the naturally occurring and clinically useful hypnotic state appears to be a product of reduced contextual vigilance (dACC activity) and disconnection from default mode resting activity, as well as enhanced coordination of networks engaged in task man- agement and somatic surveillance. " Lifshitz & Raz (2015) Compared high- and low-hypnotizable participants, out of hypnosis, on the performance of a Stroop task. Highs demonstrated greater activity than lows in the fusiform gyrus, and the pulvinar nucleus of the thalamus. Cojan, Piguet, Vuilleumier (2015) Studied the attentional performance of high and low hypnotizable participants using a Flanker task. fMRI scans taken of participants while they performed the Flanker task in a non-hypnotised state. There were no significant behavioural differences between groups, but the fMRI data indicated that high hypnotisable participants had executive control abilities allowing efficient attentional focusing. Activity in the right prefrontal cortex was found to be particularly important. Muller et al (2012) Examined the effect of hypnosis upon motor imagery. Across all of their tasks they found hypnosis-related activity in anterior cingulate cortex, superior frontal cortex, and thalamus. Cojan et al (2009) Used hypnotic suggestions of limb paralysis to investigate the effects of cognitive modulation of motor systems. As well as modelling how functional limb paralysis may occur this study also informs us about how suggestions influence the interplay between brain systems. Raij et al (2009) Examined which brain regions are involved in implementing hypnotic suggestions. They found that an area of the right dorsolateral prefrontal cortex contributes to the process. Derbyshire et al (2008) Investigated the effect of hypnotic and non-hypnotic suggestions upon chronic pain in fibromyalgia patients. Hypnotic and non-hypnotic suggestions had similar behavioural effects, but differences in associated brain activity as measured by fMRI. Mendelsohn et al (2008) Investigated the use of a post-hypnotic suggestion for amnesia. They found that the suggestion reduced memory for content but not context, and found brain activity which they interpreted as possibly inhibiting memory retrieval. Oakley et al (2007) Investigated the neural correlates of a hypnotic induction in fMRI. Röder et al (2007) Used hypnosis to study the experience of pain during hypnotically produced depersonalisation. Found reduced pain related activation in the depersonalisation condition. Egner et al (2005) Examined attentional abilities in low and high hypnotizables at baseline, and following a hypnotic induction. Raz et al (2005) Used posthypnotic suggestions affecting participants' ability to read, which knocked out the Stroop effect. Derbyshire et al (2004) Used hypnotic suggestions to generate pain in the absence of noxious stimuli. 'Real' and 'hallucinated' pain resulted in similar patterns of activity, but different from 'imagined'. Schulz-Stübner et al (2004) Studied pain responses before and after a hypnotic induction. Faymonville et al (2003) Conducted a connectivity analysis to examine relationships in activity between specific brain regions. Rainville et al (2000) Examined perceived mental relaxation and mental absorption using PET, before and after a hypnotic induction. Kosslyn et al (2000) Used hypnotic suggestion to produce positive and negative colour hallucinations. Maquet et al (1999) Used PET and suggestions of imagining pleasant autobiographical memories in hypnosis. Rainville et al (1999) Conducted PET scans before and after a hypnotic induction (in the absence of suggestion), and also with hypnotic suggestions for pain modulation. Wik et al (1999) Used hypnotic suggestion in PET to modulate chronic pain in fibromyalgia patients. Szechtman et al (1998) Used hypnotic suggestions to produce auditory hallucination. Rainville et al (1997) Used hypnotic suggestion to modulate the unpleasantness but not the intensity of a painful stimulus. Found that the anterior cingulate cortex responds to the unpleasantness component of pain. Crawford et al (1993) Used Xenon inhalation to measure brain activity while hypnotised, in pain, and with suggestions for analgesia. Different designs of neuroimaging studies can have dramatic effects upon the how results are interpreted. When conducting brain imaging studies of hypnosis there are three main approaches which are outline here. In the first type, participants rest while their brain activity is measured in a waking state. They are then hypnotised and their brain activity is measured while they rest while hypnotised. The differences between the two conditions are said to be indicative of hypnosis. The advantages of this method are that it is logically simple and relatively easy to conduct. However, it is not clear that the two conditions are evenly balanced. The experimental control is weak because what participants are thinking about in each condition is not controlled or measured: it is possible that rather than measuring hypnosis this experimental design is measuring differences in other uncontrolled variables. 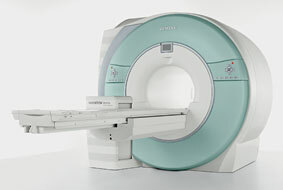 McGeown et al (2009) scanned the brains of high and low suggestible participants while they rested in an fMRI scanner, in waking and hypnosis conditions. The high hypnotisable participants showed a significant decrease in activity in the left medial frontal gyrus when hypnotised. This area is a region of the 'default mode network', a group of brain regions which are active during resting conditions. Figure: Result of McGeown et al (2009) neuroimaging study. 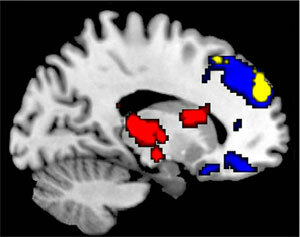 Areas of decreased activation due to hypnotic induction in the resting state in high suggestible participants (blue) and low suggestible participants (red). Significant between group differences (greater deactivation in the highs than in lows when directly compared) are shown in yellow. The next type of study adds another layer of experimental control. Instead of simply resting while their brain activity is measured, participants perform a task: in this case they are given a suggestion. This design controls for the 'contents of consciousness' to some extent. Each participant's performance of the suggestion (i.e. how strongly they experienced the effects) can also be measured, so variance associated with performance can be removed. This type of study compares brain activity in hypnosis and waking states, with participants performing the same task in each condition. Like the previous design, this task also controls for the 'contents of consciousness'. Egner, Jamieson & Gruzelier (2005) used this type of design. They measured brain activity in high and low hypnotisable participants while they performed the Stroop task. Performing the Stroop task requires participants to inhibit automatic responses, and this task is normally associated with a region of the brain called the anterior cingulate cortex: this region is said to be involved in 'conflict monitoring'. Egner et al (2005) found that in low hypnotisables, activity in this region decreased when participants were hypnotised. In high hypnotisables activity in this region increased when they were hypnotised. They interpret these results as indicating different executive control processes in high and low hypnotisable participants, and argue that executive function is impaired in high hypnotisables following hypnosis. Further, they argue that these results do not support the idea of hypnosis being a state of highly focussed attention. Figure: Result of Egner et al (2005) neuroimaging study. (A) region of the anterior cingulate cortex demonstrating conflict related activity. (B) conflict related activity extracted from region of interest in baseline and hypnosis conditions.